Happy early Halloween! Singapore does not have the tradition of celebrating Halloween (no trick-or-treat here), but people here will often buy masks / costumes and party away in clubs. Horror is definitely not my favourite genre since young – I hate watching horror movies and am absolutely frightened of visiting haunted houses, but I love the treats that bakers create during Halloween. 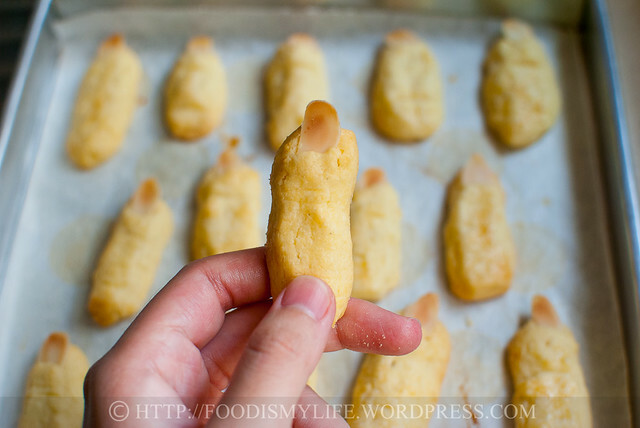 I’ve seen these Witch Fingers cookies around the net for quite some time and decided to try my hand in baking some. I used a melt-in-the-mouth butter cookie recipe to make these cookies. However I forgot that these cookies expand during baking, so some of the “fingers” became a little too fat, but overall I’m still very pleased with the results. So if you’re still looking for a treat, bake these cookies! 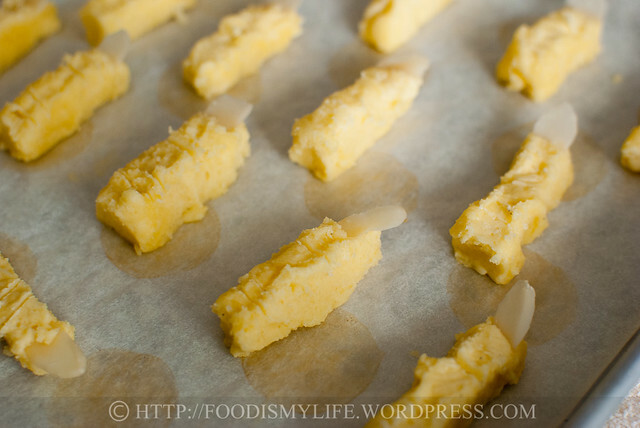 Begin by creaming some butter and sugar until light and fluffy. Beat in egg yolk and some vanilla. Sift and fold in some flour. You’ll get a very soft, buttery dough. Flatten into a large rectangle and chill for 1 hour. 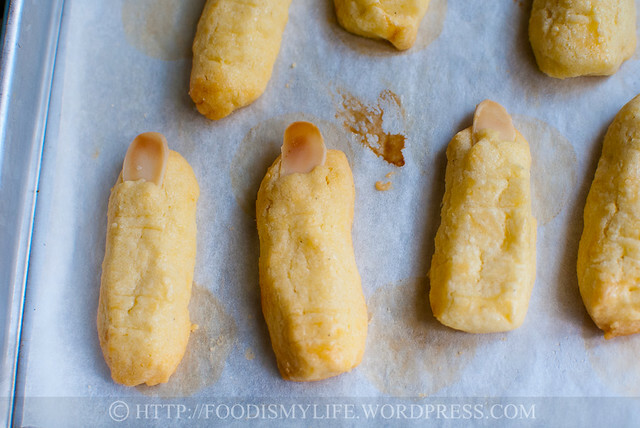 Slice the dough into “fingers” and stick an almond slice as “fingernail”. 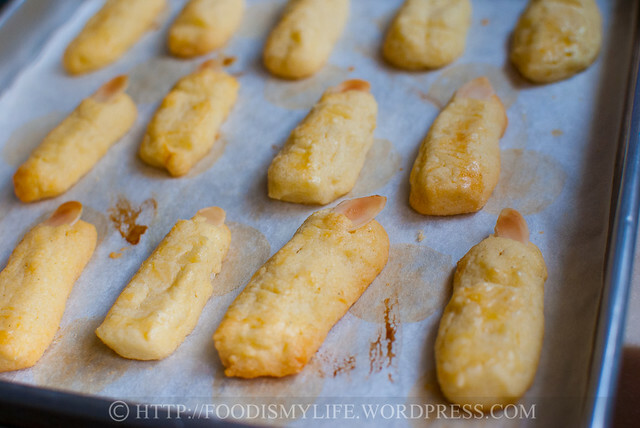 Bake until lightly golden – and devour! I’m submitting this to Recipe Box #20 hosted by Bizzy Bakes! 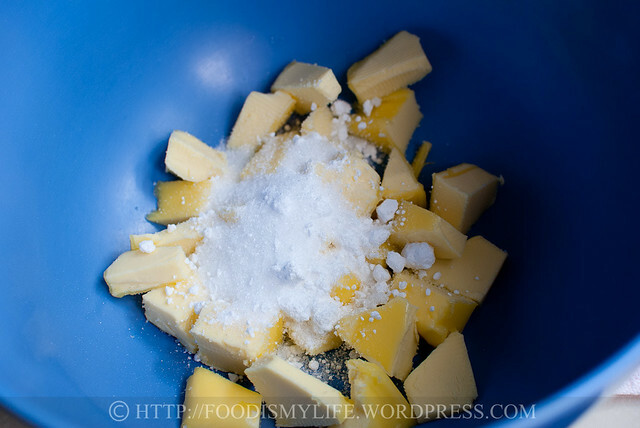 Cream the sugars and butter in a large mixing bowl until light, pale and fluffy. 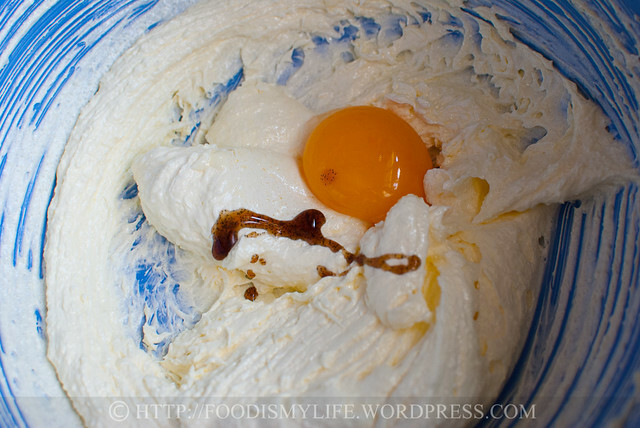 Add in the egg yolk and vanilla and beat until fully incorporated. 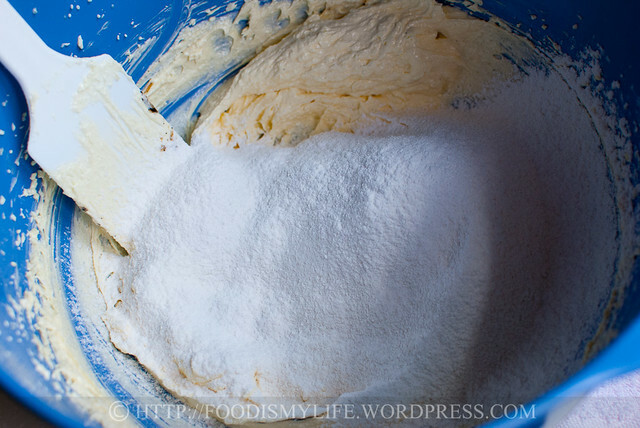 Sift in the flour in two batches and fold it in with a rubber spatula. 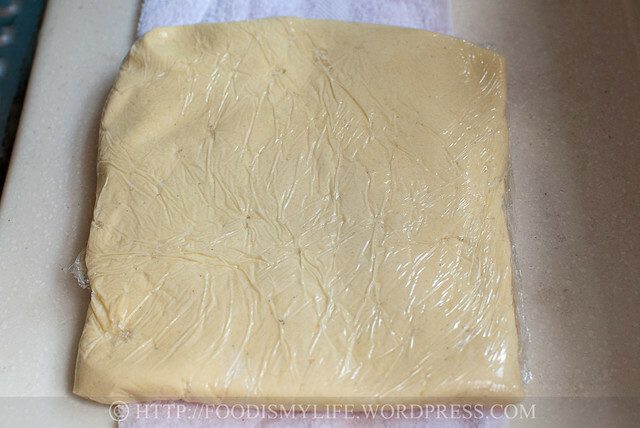 Transfer the dough onto a large piece of plastic wrap (cling film). 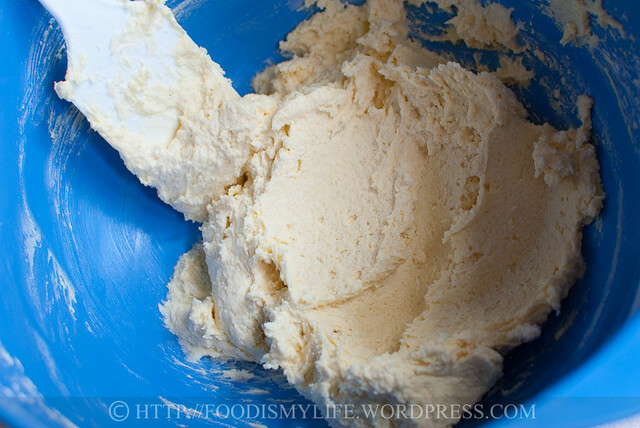 Spread the dough out into a large rectangle/square into ½-inch thick. Wrap it up with the plastic wrap and refrigerate till firm, at least 1 hour. Preheat the oven to 160 degrees Celsius. Line a baking sheet with parchment paper. Unwrap the dough and cut it into 1½-inch by ½-inch rectangles. Pinch the rectangles slightly to form fingers. Stick a piece of almond flake in the front for he fingernail. Score the dough slightly with a small, sharp knife (look at your own finger as guidance ;)). Place the cookie dough onto the baking sheet and bake for 10 to 13 minutes until lightly golden. The cookie will expand during baking. Cool the cookies completely on a wire rack and store in an air-tight container for up to 5 days. It’s all about the fingernails. Yikes! Creepy and realistic looking withered fingers! I am a huge horror fan! Oooh….eerie fingers! Love it! Yes, I have seen this before and have forgotten all about it! Some of them even have raspberry or strawberry jam smeared at the “stump” to make it even more gorry! I am not into horror movies anymore, I guess, mellow with age! Used to stay up late for horror movies when I was young, but not anymore, they give me the creeps!! Hahaha! I think your witch fingers turned out really good. I agree with you about horror movies…not my thing.